The thing about having a chronic illness like lupus is that the world keeps turning and being frustrating, even when you would really appreciate a vacation from it all. The last year or so has been particularly difficult. Whether its mass shootings, daily allegations of sexual abuse by men we admire or just the hate-filled rhetoric that has become our political discourse, the pressure coming from the outside can feel like an enormous weight to be added to our already full bag of struggles, stress and hardships. We carry these things because we are more than our disease. We are men and women who have passions, thoughts, opinions and even just plain old musing. We are whole, complicated people but often getting to be whole and complicated hinges on our health. I can’t follow my passion to write when my brain fog is so strong I can’t spell my name. I can’t express my thoughts or form opinions when I’m so tired nothing matters. We have to be in the best place we can which means it’s vital that we be extra vigilant about protecting ourselves from those outside pressures. Of course, you may be in a place in your journey where you just can’t with all this stuff – I totally get and respect that. But, for those of us ready to engage with the wider world, here a few tips to protect yourself. 2. Act on your convictions. If you struggle to get out of bed every day you might be inclined to skip this step, but please don’t. When I say act on your convictions, it could mean go volunteer or go to a meeting to talk about the big issues and brainstorm solutions, or it could just mean pray or meditate. Smile at a stranger. Tell someone in your life how amazing you think they are. Action doesn’t have to be a big grand gesture, it just means to strike back against the ugly with love. Remember to direct that love as much inwardly as you do outwardly. 3. Use your energy wisely. When you have dealt with or are dealing with fatigue (like the exhausted in your bones kind), you realize energy is kind of like money. You don’t always have it. If you don’t spend it wisely, you can end up hurting. Spend your energy wisely, preferably on things that will increase your energy and help you heal. 4. Get yourself to your community. A big part of taking care of yourself is finding and being apart of a community of uplifting people who support you and are worthy of your open heart. Maybe that means your local lupus support group and/or your church. Maybe it means an online community of people who share your love for knitting or “Jane the Virgin.” Thanks to the internet, community can be cultivated anywhere; it just takes action on your part to find it and show up. The world is a broken place filled with broken people, but it’s also a beautiful place filled with loving and caring people. 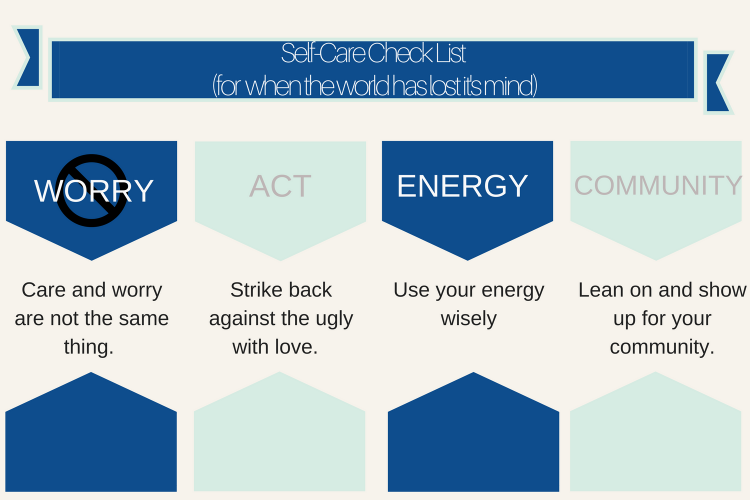 Take care of yourself, your heart and your mind.